It's time for another episode of 205 Live on the WWE Network! Cedric Alexander has proved that he belongs as champion and his era continues. General Manager Drake Maverick has announced we will see Drew Gulak vs. Hideo Itami vs. TJP vs. Mustafa Ali in a fatal 4-way match to determine the #1 contender. Who will be the next challenger? Tune in for all the details. Hit F5 to refresh the live recap! Tonight's show starts out with GM Drake Maverick hyping up tonight's fatal 4-way match with the winner getting a Cruiserweight Championship match against the champion Cedric Alexander. "Four men, one opportunity at the Cruiserweight Championship, we'll find out who it will be tonight on 205 Live." Cue the open! Gallagher starts the match with an armbar, snapmare, shoulder block, fireman's carry, Tozawa escapes, Gallagher with a sunset flip, Tozawa rolls through, kicks him in the chest and hits the jumping senton. Gallagher takes over and hits forearms and elbows in a mounted position. Tozawa chops him, another chop, hits the fake-out jab, knocks him off the apron, goes for a baseball slide but Gallagher lifts up the ring skirt and pummels him on the back. Gallagher throws him back into the ring, covers for 1, covers for 1 again, thne puts him in a neck crank as Maverick talks about the individuals in the fatal 4-way match. Gallagher body slams Tozawa, covers for 2, then puts him in an armbar. McGuinness asks the GM why Buddy Murphy isn't in the match, and Maverick replies Murphy lost two recent high profile matches. Gallagher continues to work on Tozawa's left arm with an armbar and a knee for added pressure then stomps on the elbow. Tozawa gets fired up, Gallagher mocks him, Tozawa kicks him, misses the spin kick, sprawls under him and hits the spin kick. Gallagher rolls out the ring, so Tozawa jumps off the top rope and connects with the suicide dive, throws him back in, hits the missile dropkick and covers for a near-fall. Maverick mentions that Tozawa needs to get on a roll if he wants to be considers a contender. Tozawa hits a jump 'rana then applies an octopus stretch, but Gallagher counters with a spinning sidewalk slam! Gallagher with a dead-lift powerbomb, covers for 2.5, Tozawa is up in a corner, Gallagher goes for the dropkick but flips over and lands on his feet with a smug look. Tozawa counters a suplex, hits the shining wizard, gets fired up, goes up top, Gallagher hits a forearm to cut him off, climbs up to him, hits an elbow, Tozawa fights him off, suplexes him back down, Gallagher is in position, and Tozawa connects with the HIGH DIVING SENTON SPLASH for 3! WINNER: AKIRA TOZAWA. Big win for Tozawa here. He heads out the ring, walks up to Maverick, and basically tells him that he wants Lio Rush again. Backstage, TJP is in a locker room laying on a counch and sarcastically says he's proud of Maverick for thinking of him to put him in the match. He talks about taking out Noam Dar last week, then says "The Cruiserweight Championship is coming home." Hideo Itami is warming up backstage and says that Cedric Alexander got past him in their last match, but "next time he won't." Lince Dorado and Kalisto come out next to represent The Lucha House Party, while Gran Metalik is absent to take care of his work Visa. They call out Tony Nese and Buddy Murphy, and they even have new t-shirts. Dorado starts the match with one man, does the Lucha dance, slaps him on the chest, flips around, puts him in a side headlock, slides under room, jumping hurricanrana, blocks a combo and superkicks him, then hits the running bronco buster. Buddy Musphy is, in fact, watching the match backstage in the locker room. Kalisto tags in, jumps onto Dorado's shoulders for a splash, and Dorado hits a planking splash. Kalisto tags out, Dorado kicks him, Irish whip reversed but he hits a spinning heel kick. The other guy runs in, Kalisto kicks him from the apron, Dorado hits a double Golden Rewind to both men, and tags out while doing a flip dive to one guy on the floor. Kalisto hits SOLIDA DEL SOLto the legal man and gets the W. WINNERS: LUCHA HOUSE PARTY. Drew Gulak is in the locker room getting ready and talks about how a fatal 4-way can be unpredictable, but one thing is for sure: "If you step to me, you will tap out." Finally, we see Mustafa Ali and he says all he has to do is eat kicks from Itami, hobble on one leg after TJP tries to break his leg, then survive whatever else Gulak has to try to hurt him. "Then all I have to do is hit the 054." Simple plan, but can he do it? That match is next! Lio Rush is walking backstage, Dasha asks for his reaction to Tozawa asking for a rematch, and he plays it off. "I think I already beat Tozawa. With all due respect to the former Cruiserweight Champion, the man of the hour is in a league of his own. So I think he should keep my name out of his mouth." The bell dings, each men look around, Gulak strike Ali first, Itami joins him, TJP backs off, and they stare him down. TJP charges, Ali flips over Ali and clotheslines Itami. Gulak headbutts Ali in the gut, Irish whip, Ali kicks him in the shoulder, TJP with a back kick to Ali's midsection, Irish whip reversed, and Gulak side-steps TJP who swings through the ropes onto the apron. Ali rolls under Gulak's clothesline attempt, hits TJP with a forearm, double-leg to Gulak and catapults him into TJP, then rolls Gulak up in a sunset flip, but Itami kicks Ali in the back to break the count. Itami stomps on Ali, shouts "Respect me!" and proceeds to stomp on his head. Ali gets sent into a corner, puts a boot up in Itami's face, punches Gulak, springboards but Itami kicks him in mid-air. Cedric Alexander is watching the match backstage. Itami hits a knee to Ali's midsection, TJP breaks the count, backs off, Ali rolls Itami up for 2, hits a headscissors to an incoming TJP, blocks a kick from Itami and connects with a spinning heel kick to the jaw, but then Gulak comes in with a lariat to Ali spinning him around. Gulak picks Ali up by the hair to put a neck crank on him, Aali gets to his feet, Gulak throws him back down, delivers a gourdbuster, TJP breaks the count at 2, backs off again, Gulak holds Itami back to separate both men and says "I get it. We gotta beat up Ali." Gulak, TJP and Itami all give Ali a back body drop. TJP makes the next plan, he and Gulak send Itami into Ali with a clothesline in a corner, then Gulak and TJP double suplex Ali, but TJP rolls Gulak up on the way down! Itami stomps on him to break the count, TJP asks why he hit him, Gulak gets in TJP's face,Itami shoves him, TJP shoves Gulak, but then Ali lies onto all three with a diving crossbody! Ali chops TJP, TJP counters the Irish whip into an octopus stretch and puts Itami in an abdominal strecth AT THE SAME TIME, but then Gulak lurks in the background, comes up behind TJP and locks in the Gory Special! Gulak brngs his shoulders down for the count, TJP barely gets the right shoulder up at 2.5, back down, left shoulder up at 2, counters with a roll-up for 1, Gulak counters for 1, then TJP does the headstand headscissors, Gulak counters into his own headscissors, both with technical takedowns and escapes and they have a stalemate. Itami then hits TJP from behind and by domino effect hits Gulak sending him out the ring. TJP backs off into a corner, point behind him, Itami turns around, and for whatever reason goes over to Ali to stomp on him. Itami tells TJP to go up, picks Ali up in an electric chair, but Ali slips off and sends Itami into TJP. Ali then gives TJP a frankensteiner from the top sending him into an oncoming Gulak! Ali ducks a backswing, takes Itami down with a back elbow, Irish whip reversed, and hits a pop-up dropkick. TJP kicks him, Ali side-steps onto the apron, kicks him in the head then hits the slingshot rolling X Factor! Now Ali ducks a swing from Gulak, delivers a swinging DDT, covers, and both TJP and Itami break the count. All four men are down. Gulak pops Ali up and slams him down. TJP hits Gulak with a jumping spin kick. Itami boots TJP right in the face. Ali superkicks Itami! All four men are down AGAIN. Ali avoids the Detonation Kick, ducks a clothesline, and both men collide in mid-air dead center from dual crossbody blocks! The crowd chants "This is awesome!" Gulak and Itami lock eyes, they meet in the middle, Gulak shouts "I respect you! Shake my hand!" Itami goes to shake but Gulak slaps him across the face, so Itami slaps him back, Gulak hits a forearm, Itami hits a forearm and a running boot, Gulak hits a running boot, Itami hits two running boots, Gulak delivers a suplex, floats over but only gets a 1-count. Itami blocks a suplex, kicks him in the head, delivers the falcon arrow, and Gulak kicks out at 1. Both men trade forearms, they have a scuffle falling out the ring, they continue to battle around the ring, and Itami kicks him in the head. Meanwhile in the ring, TJP dropkicks Ali in the knee, Ali falls onto the middle rope, hits the springboard basement dropkick, Itami and Gulak pull TJP off the apron and slam him into the barricade. Gulak and Itami go back to hitting each other until Ali lands on them with a springboard somersault plancha to the floor! Ali throws TJP back in the ring, hits a springboard tornado DDT, drags him into position, climbs to the top, connects with the 054, but Itami yanks Ali off the cover and slams his head on the steel steps! Itami backs up, charges, hit sthe Hesitation Dropkick to Ali's head against the steps then tosses him head-first into the ringpost! Itami throws Ali back into the ring, Gulak throws Itami head-first into the ringpost, gets back in the ring, locks in the GULOCK to an unconscious Ali, the referee checks Ali's limp arm and calls for the bell! WINNER and #1 Contender for the Cruiserweight Championship: DREW GULAK. Gulak jumps for joy in the ring as The Brian Kendrick and Jack Gallagher are there to applaud his victory. 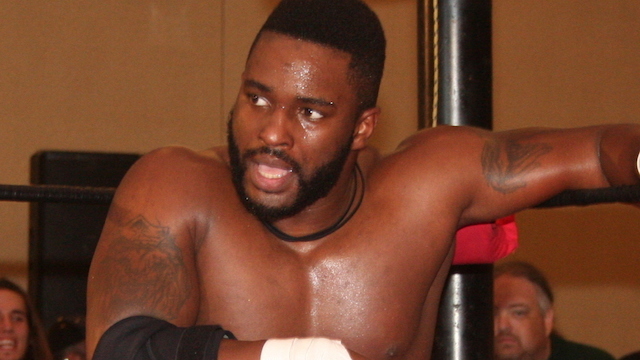 Cedric Alexander looks on at his future challanger for the title. Gulak is the next man to get an opportunity at the Cruiserweight Championship. That's all for 205 Live!